On Second Scoop: Ice Cream Reviews: Pizza! Pizza! with Nerd Lunch and Junk Food Guy! Pizza! Pizza! with Nerd Lunch and Junk Food Guy! That's right Nosh Show Listeners, Nerd Lunch has convinced our old bud Eric the Junk Food Guy to (briefly?) step out of podcasting retirement and have some sweet sixteen inspired pizza talk. Woohoo for the return of your friendly neighborhood JFG. I know the very adorable junk food baby keeps him busy, but it was nice to hang out again, even if only for an hour and a half. 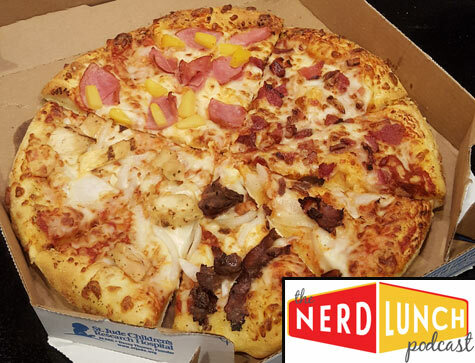 So, what exactly did we discuss on episode 302 of the Nerd Lunch Podcast? (download here if you prefer). Well, we nominated 16 pizza toppings to face off in a sweet sixteen style tournament to see who would be voted the best pizza topping of all time. Now, I don't know about you, but I love pizza oh so very much. I feel like most people like pizza, but it usually comes down to whether they prefer chain pizza (domino's, papa gino's, little caeser's, etc) or what I call "town pizza" (aka local pizza). See, where I live, I feel like most local non-chain pizza joints taste very similar. Some better and some worse mind you, but the general vibe of the pizza you get is strangely the same. I can't really describe this pizza as it's nothing like a nice thin slice of fresh Jersey boardwalk pizza, so just trust me that it's different. Anyway, there is a lot of pizza talk and it was a lot of fun. To be honest, I think I was dialing in crazy Nosh Show co-host Dubba more than geeky Nerd Lunch guest Dubba so I hope that's ok with everyone. Please give the show a listen and then let Eric know you miss him via your favorite social media platform. That's it! Have a good week everyone! I do miss Eric! 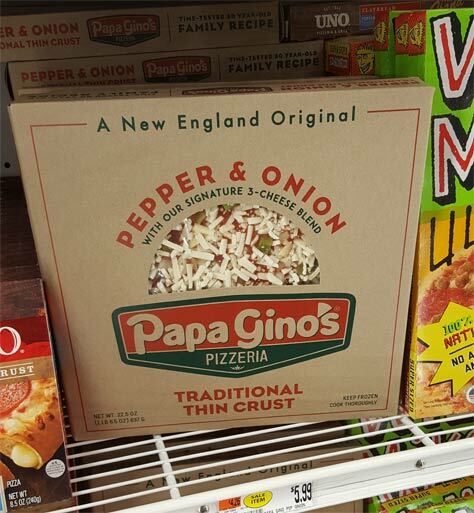 I'm not surprised he couldn't pass up a big podcast on PIZZA! Doesn't he hold some kind of record for most pizza pies eaten in a year or something?! Hope all is well with the new baby! I definitely still miss The Nosh Show! I notice JFG hasn’t updated his page since around September. I hope he'll eventually get to reviewing snacks again. Even if not, he had a hell of a good run. One of my favorite sites to read.